Spa Water Sanitizer, Hot Tub Water Sanitizer, Spa Water Purifier, Hot Tub Water Purifier, Spa Chlorine Generator, Hot Tub Chlorine Generator, Acura Spa Systems - Prozone CSS5 Ozonoator - The best spa water purification! Proudly designed and manufactured in the USA! Save money! Buy manufacturer direct! Eliminate the middleman! Since 1987, we've powered over 1.3 million spas with our support systems. We 100% can power your hot tub with our robust equipment. 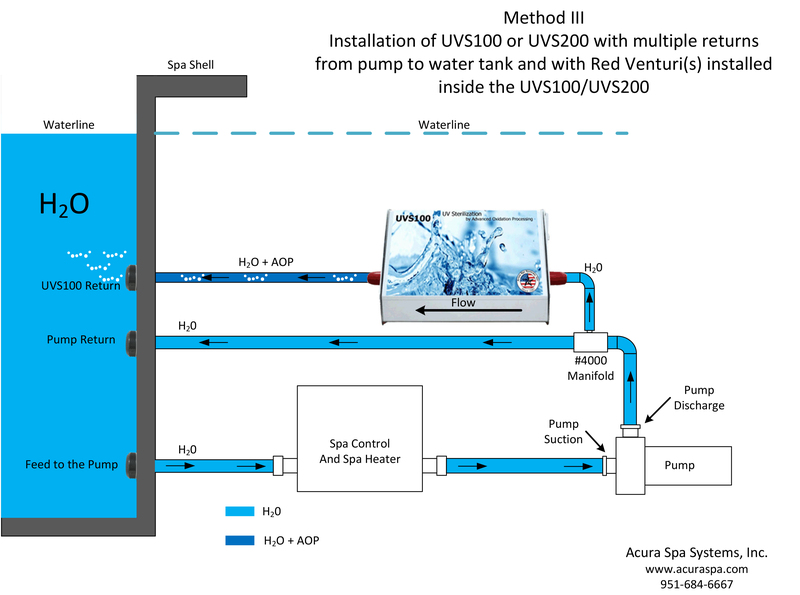 To get a quotation, you may email photos of your spa support systems to sales@acuraspa.com. Click here to see photos we need. Call us while you are on our website at 951-684-6667 ext. 223. We will guide you to design a new spa pack for your hot tub and answer all your hot tub questions. 1. Choose your options from the table below. 2. Verify the model description. 3. Change the quantity (if needed). 4. Click 'Add to Order' button below the quantity. 5. Click 'View Order' button to check and submit your order. Methods for connecting UVS100 to your spa. MT, PM, FT, HL, CHL, CHLAP, QS, EXT, EXTAP (Megatrol, Power Master, Flexitrol, Hotline, Minitrol, Quickset controls), PS (Power Source control or all pneumatic controls), PW (Balboa controls), J (mini JJ plug) or 00 (wires are provided loose with male pins, you connect to match your control receptacle). 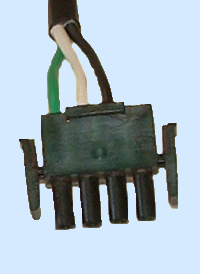 Choose the appropriate connector (denoted by part number suffix) for your application. All electrical work must be performed by a licensed electrician according to National Electrical Code and all local codes and regulations. All plumbing work must meet I.A.P.M.O., UL 1563, and all local codes and regulations and must be performed by a licensed plumbing contractor. 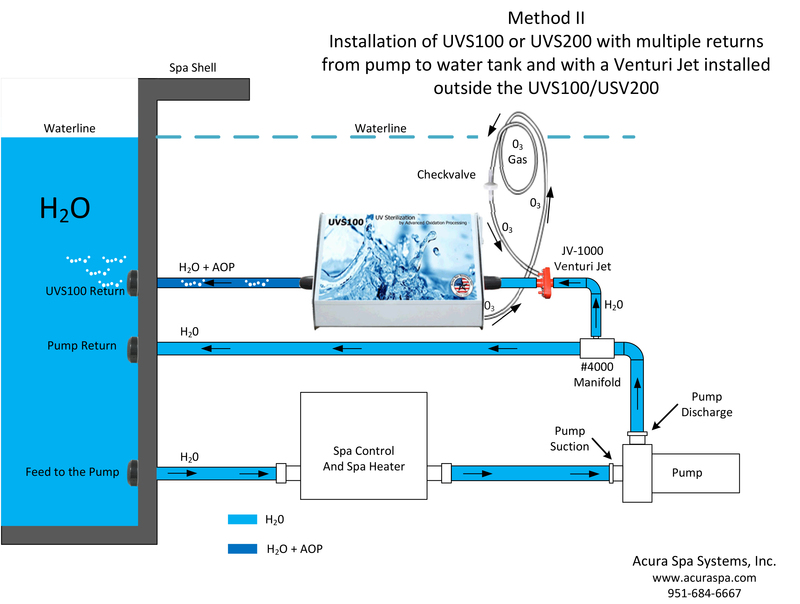 All pump suction must be connected to two drains (VGB certified) in the spa to meet all safety requirements. All shipments are F.O.B. Riverside, California. *Free Freight only for Fedex SmartPost. Other forms of shipping incur additional shipping costs. **Beating competitor's price: We will meet or beat any competitor's written quotation for hardware of the same capability, such as: plumbing size, voltage, motor horsepower, motor 1 or 2-speed, heater length, safety test report, etc. A $7 Handling charge is applied to all orders. All products sold per our "Terms and Conditions" found in the "Support" section of our menu. 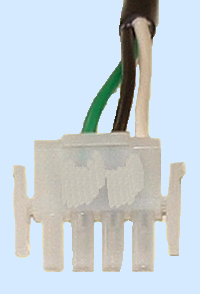 When your order is produced, the pump motor used (A.O. Smith, Regal Beloit, Marathon Electric, etc.) will be whatever is in stock in our factory at the time. Copyright © 2005-2016 Acura Spa Systems, Inc. All Rights Reserved. This website and its content are the sole property of Acura Spa Systems, Inc.
Any duplication, copy, or use of any of these contents without prior written permission from Acura Spa Systems, Inc. is strictly prohibited.